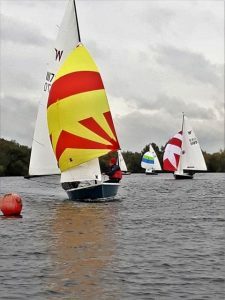 A small but select fleet of Wayfarers sailors met at Swarkestone SC, just south of Derby, for their inaugural Wayfarer Open Meeting over the weekend of 6/7 October 2018. This was also event seven of the Craftinsure National Circuit and Travellers Series. The wind was cold and from the North (not the best direction for the lake). It was also very wet, both the journey and rigging the boat. The good news is that the wind was not as venomous as forecast and the welcome was warm. The course to be sailed was an upside down W with a shortish beat in the best wind on the lake from the start and included a long reach along the south shore where judicious use of the spinnaker would sometimes pay off. Three races were sailed on Saturday afternoon, all won by the Wilsons. Brian Lamb/Sam Pygall lay second overnight with Mike and Carl Weighill in third. Second to fifth places were close overnight, so all was to play for with two races scheduled for Sunday. Sunday dawned as a frosty crisp morning with mist rolling over the water, picture perfect but not so good for the sailing. The wind direction was from the west, a much better direction for the lake. As the mist cleared so did any trace of the wind, leaving a mirror finish. 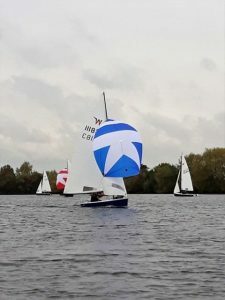 With two races forecast the postponement flag was raised in the hope that the wind would return in time to complete the schedule. A light but patchy westerly finally settled in and a shorter course was skilfully set by the race officers. Racing got underway, the decision when and when not to raise the kite in fluky conditions proved paramount. Positions swapped at the front and gave Bill and Lisa a win in race 4 with Brian and Sam in second and the Wilsons in an out of character third. By the start of the last race, the wind had shifted slightly south and a course change was made again. 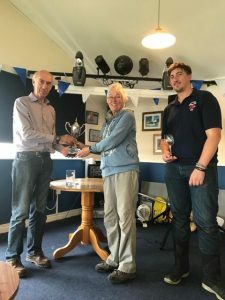 The Wilsons had the trophy in the bag, but the remaining podium places were open to three boats. The new wind direction meant more shifty conditions, and anticipating direction changes on the approach to marks proved critical. In the end Brian and Sam pipped the Whitneys to end up second overall and the Whitneys managed fourth and finished third overall. Andrew Wilson thanked the race team for doing their best in difficult circumstances and on behalf of the visitors thanked Swarkestone for their warm welcome. They walked away with the brand New Swarkestone S.C. Trophy (with lid!) and their name will be the first to be engraved for this new Wayfarer open. Nobody left empty-handed, however due to the generosity of our sponsors. Hartley Boats donations included a buoyancy aid and jacket amongst other goodies. Craftinsure donated a host of burgees and waterproof bags. A raffle was held and everyone had a prize.